Car audio systems can be tremendously complex, and car audio system problems are often difficult to root out. In addition to having all the same components of home audio systems, car audio systems are also subjected to temperature extremes, vibrations, and other stresses on the road. So while car audio amplifiers are just one component among many, the problems they can introduce are vast and varied. Some car audio problems that are commonly attributed to amps include sound distortion, no sound at all, and even bizarre sounds like farting. 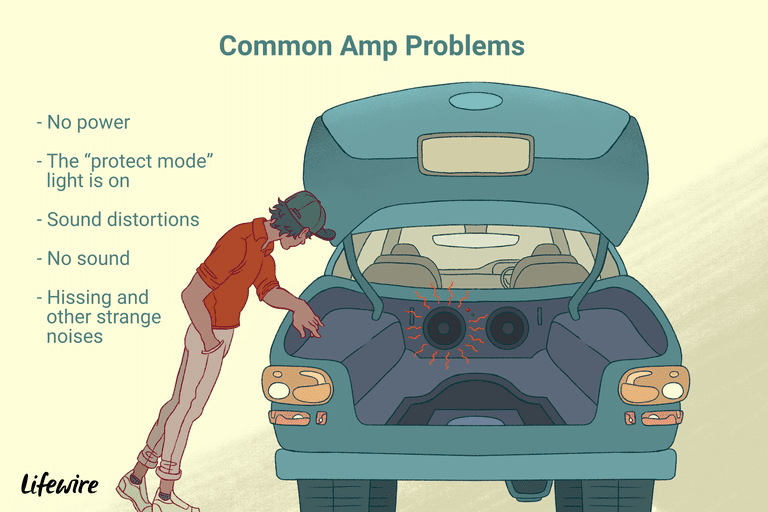 Some of this can be caused by a broken amp, but all of them can be caused by other underlying issues that will still be around if you try to fix the problem by throwing a new amp at it. In order to turn on, your amp needs to have power at both the remote and power wires, in addition to a good ground. So if you notice that your amp isn’t turning on at all, that's a good place to start. If the remote turn-on wire doesn't have power, your amp won't turn on. The remote wire acts essentially like your finger flicking a switch, where your finger is battery power, and the switch is a mechanism inside the amplifier. The remote turn-on wire usually comes from the radio, in which case your amplifier won't turn on if the radio isn't on. So if there is no power at the remote terminal on your amplifier, the next step is to check for power at the corresponding wire where it connects to the radio. If your amp is wired incorrectly, and the remote turn-on is connected instead to the power antenna wire on the head unit, you may find that the amp only powers on sometimes. In this specific situation, the amp will usually only turn on when the head unit audio input is set to AM or FM radio. The power wire is the next thing to check if you find no problems with the remote wire. This wire will be much thicker than the remote wire, and it should have battery voltage. If it doesn't, you'll want to check for any inline fuses and verify that the wire isn't loose, corroded, or shorted out somewhere. If the remote and power wires both check out okay, the next thing to look for is continuity on the ground wire. If the ground connection is poor, or it isn’t connected at all, the amp may fail to turn on or not work very well. Should you find that the amp has good power and ground, that the remote wire has voltage when the head unit is turned on, and that none of the fuses are blown, then you’re probably dealing with a busted amplifier. Amplifiers are often designed to go into “protect mode” to avoid further damage to internal components. If your amp has a “protect” light, and it’s on, then chances are good that you have a faulty speaker, subwoofer, cable or other component. First, you’ll want to check for power, as outlined in the “if your amp doesn’t power on at all section,” just to cover your bases. If everything there checks out, then you will have to rule out problems with individual components. The first step in diagnosing an amplifier protect mode light is to simply unplug the speaker wires. If you notice that the light turns off at that point, it’s a pretty safe bet that the problem lies in one of the speakers. To determine ​where the problem is, you can perform a visual inspection on each speaker and subwoofer in your system. If you notice that any of them are blown, then that may be the cause of your problem. You can also use an ohmmeter to verify that none of the speakers are grounded out, which can occur if any speaker wires become loose and contact ground or if the speaker connections themselves are in contact with bare metal. If you are unable to find any problems with your speakers, RCA patch cables that are grounded out or otherwise faulty can also cause the protect light to come on. To check this, you can simply hook up a set of good RCA cables to your head unit and amp. If that causes the light to turn off, replacing the RCA cables will fix the problem. Clipping is a type of sound distortion that occurs due to an audio waveform being “clipped” by the amplifier. This is a sign that the amp is being overtaxed by a subwoofer or other speakers to the point where it simply can’t provide enough power. In home audio setups, clipping is typically caused by an underpowered amp or inefficient speakers, but loose or burnt wires can introduce similar problems in cars. An amp that simply isn’t powerful enough for the speaker, or speakers, you have hooked to it is the single most likely cause of clipping, in which case you’ll either need to upgrade the amp or downgrade the speakers. So if you feel like your woofer or subwoofer amp is clipping, the first thing you’ll want to do is compare the amp’s power rating with the speaker. If you find that the amp has plenty of power for the application, then there could be a problem with your speaker wires, the speakers themselves, or the amplifier’s ground. If your amp is turning on just fine, then you’ll want to make sure that it’s receiving an input from your head unit. This is a pretty easy process if you have access to both the head unit and the amp – simply unplug the RCA cables from each unit and reconnect them with a good set. Verify that the head unit is turned on, the volume is turned up, and cycle through multiple inputs, like the radio tuner, CD player, or auxiliary input. If everything works after bypassing the installed RCA cables, then you’ll just need to replace them with a good set. If you get sound from one input but not another, the problem is in your head unit, and not your amp. If you still don’t get any output from your amplifier, then you’ll want to try disconnecting it from the speakers in your vehicle and hooking up a known good speaker that isn’t in your car. If the amp drives that just fine, then you have a problem with your speakers or wiring. If you still don’t get any sound, then you could have a faulty amplifier, although you’ll want to check that it isn’t in “slave” mode, and that you don’t have conflicting filters before you condemn the unit. In order to track down the source of your distortion, you’ll have to rule out each potential cause. First, you need to inspect your patch cables and speaker wires. If the cables that connect your head unit and amplifier run alongside any power or ground cables at any point, they can pick up interference that you will then hear as distortion. The same is true of the speaker wires. Although this can be an annoying problem to track down, fixing it is a simple matter of rerouting the wires so that they don’t come close to any power or ground cables, and that they cross at a 90-degree angle if absolutely necessary. Using higher quality cables or wires with good shielding can also help. If you aren’t able to find any problems with the way your patch cables or speaker wires are routed, you can try unplugging the speakers from the amp. If you still hear noises, then you’ll want to check for a bad ground. Of course, the problem could always be in your head unit, or whatever else you’re using as an audio source. For more information on how to diagnose that type of problem, check out how to deal with ground loops, and more details about what causes car speaker whine. Strange sounds can come from a subwoofer that's overpowered, underpowered, or simply installed incorrectly, so getting to the bottom of this particular problem can take some work. First of all, you’ll want to eliminate any problems with your speaker enclosure. If the enclosure isn’t the right fit for your particular sub, then the typically won’t sound right either. If the speaker isn’t mounted properly, it can allow air to escape while you’re listening to music. This can lead to an unfortunate farting sound, as the vibrating speaker cone drives air into and out of the box past the seal. This can be fixed by simply seating the speaker properly. If there's nothing wrong with the enclosure, then you’ll want to make sure that the woofer is impedance matched. Impedance matching is pretty simple if you have one sub hooked to one amp – it either matches or it doesn’t. If you have multiple subs hooked to a single amp, then you’ll have to do some calculations based on whether they’re hooked up in series or parallel. Should you find that the impedances match, then you’ll want to check both the power ratings of your sub and your amp, and make the necessary corrections if the amp is either under- or over-powered. In a case where you’re simply overpowering the sub, you can either get a bigger subwoofer or just don’t overpower it, i.e. turn down the gain at your head unit, turn down the bass boost, and adjust all the settings until your woofer stops farting all over the place. Why Won't My Car Radio Turn Off?